Although it doesn’t happen with enough frequency to cause too much alarm, Winnipeg cops continue to lose the cartridges for their Tasers. Police have disclosed four missing cartridges in the last 10 months. That follows four getting lost over an eight-month period in 2010 and a promise of review of what was happening (see link). The reported loss of one this week reminded me I had asked Chief Keith McCaskill about it early last year during a media sit-down but never wrote about what he said. (I believe this was May 2011). What’s with the Taser cartridges falling off? There’s wear, getting in and out and they disengage. And we’ve been talking to training (division) and all that stuff and coming up with better plans and so on. Because that’s where it is. Because every time I see one. I think, ‘it shouldn’t be happening.’ And that’s the issue. It’s an equipment issue. Is it happening when they [officers] get out of cars, on pursuits? I guess at different times either gets pulled off — it’s an equipment issue to make sure it doesn’t happen, looking at different types of equipment to ensure that it doesn’t happen. But it has. Yeah. And they’re bumping things and banging things and things like that and that’s what’s happening. (Another reporter) Is this an isolated issue here in Winnipeg? No … It’s wearing on equipment, banging into things, things like that and all of a sudden … but we’re constantly looking at something better. Because you think of all the officers that have been wearing these for years and most cases it doesn’t happen. But again, it’s a banging … a wearing on the pouch. You’ve got to be on top of these things and we’ve got to look at better equipment so hopefully it will last longer. There’s no one thing the same, but it seems like, I don’t know, we’ve had four to five in the last while. One is too many. But that’s what it is. We automatically report it because, I mean look — we look silly but we have to do that. So it’s an equipment issue that you’re working to solve, or have solved? Well we thought we were solving it, and then something else happens. We keep … it’s banging into things, it’s all those things that occur. And if, for instance, I was wearing my gun belt I couldn’t fit in this chair … and so you sit down, you might sit in a restaurant and boom, bang, and it’s gone. It’s the banging and thumping and all that stuff. Or wrestling with somebody you’re arresting and all of a sudden you don’t realize it’s gone until a couple hours later. Because you should be aware of what you’re wearing all the time, but y’know, after a period of time you don’t think about it, right? And all of a sudden it’s gone and you don’t know where it is. Looks like there’s still some work to be done. 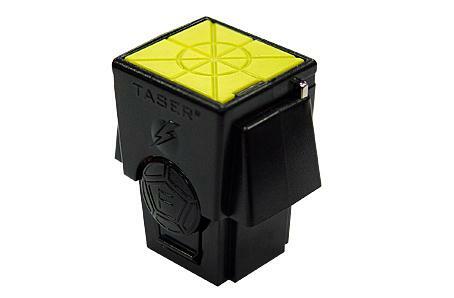 By my count, cops have disclosed the loss of Taser cartridges 11 times since Oct 27, 2006. Why is it that we don’t hear similar reports out of Manitoba’s RCMP? I can’t think of one time Mounties have reported a lost cartridge. Could be they do less wrestling and running than their WPS counterparts. Who knows.